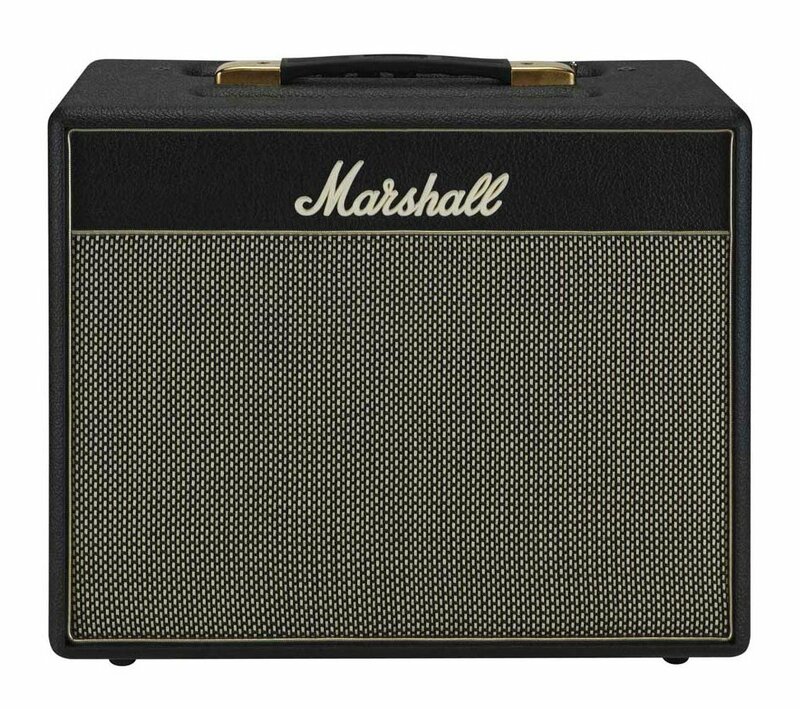 Class 5 Combo [2011-2012], Tube Combo Guitar Amp from Marshall in the Class 5 series. GuitareNoobs's review (This content has been automatically translated from French)" Excellent!" It sounds hard! Its clean: first quarter of the volume knob (it also depends in large pickups) .. all the rest crunch that is just delicious! A creamy hair! Everything is settled with a volume knob and equalizers so "is connected and did a great noise!" The rendering is beautiful with the pedals! A retro mouth, a sound that rocks! gouna's review (This content has been automatically translated from French)" Great"
5w tube, HP 10 inch, no effects, 3-band EQ, 1 position attenuation. Very nice clear sound that tends to cruncher with good sharp attack. Push the volume above 3 or 4 is not feasible in an apartment, even with the Low Power mode engaged. To ring the TDCA and company must go through an attenuator (I model here is a P & P 22w), or play again in a small room, or outdoors. The attenuator plugged into the "external HP 16ohms" output sounds too loud even 21dB (but it still sounds as strong as without attenuator position Low power mode). At that moment I was very disappointed with the attenuator. The trick to decrease the volume still is plug in the output "low power mode", but do not go to the bottom jack or the sound does not come out. So you can really play chamber volume of apartment without piss person here really sounds! Between -15 and -18 db is the top. For the evening the -21 db position is the ultimate weapon. This amplifier coupled to an attenuator is really great. Me looking sounds of the 70s I'm thrilled. Jean Dirépaplus's review (This content has been automatically translated from French)" "Class" is nothing to say"
Mine is a V3 purchased in May 2012. It is equipped with the "low power mode" in which series can be used easily at home. For more detailed specifications, see the notice or other site builder. On power, it is a 5 watts that trunk. The date of purchase I compared it with some of these competitors (Blackstar HT5 and Fender Champion 600). The least one can say is that it pushes the guy! It is a breeze. The panel offered by the eq is not monstrous but it is enough to adapt to guitars tested (lag roxane standard strat mex, Gibson LP and SG). The sound is good with all those guitars, then it's a matter of taste. The volume can manage the drive. Well this is one of the main points discussed. With the "low power" mode (on older versions the manip is not very hard to achieve apparently) two uses are possible: at home (frankly it goes in any case I am not confused with my neighbors) and in small groups (if you play alone in bars, that makes him outright). For a larger group "complete" with a drummer that will but only drive. Play with two amps it can be nice too (one clear and the Marshall). After several years of complete cessation of the guitar (big wrist problems, no it's not what you think!) I could get back to a few months ago. But I had no amp. I was off in search of a simple amp with good sound. A clear round and warm with low volume, really nice. A powerful drive a little muddy but really cool. I prefer to play to the limit (4 on the volume is going to say), it's really the crying. The work volume is very interesting. Duplication of Roxane really are to their advantage. - Little Big Muff: I tried, I insisted, I gave a little better with the Strat with Roxane. - The DS-1, not bad at all but it still blows ... but suddenly I feel that I can send a "modder" to use it more often. - Small Clone, nice on the clear stuff for a little jazzy. To avoid the drive. Good to see my collection, you understand that I'm not a big user of effects. I use the amp mostly live. But I'd better test with a Tube Screamer (Maxon OD-9 makes me a little eye anyway). So an amp "old." We buy because we fell in love with this sound. And when you love, issues management challenges the power of the beast becomes secondary. And then use it fared very well. 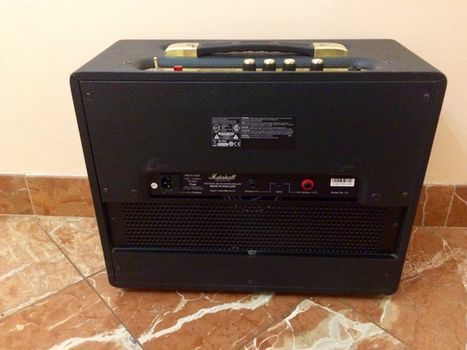 This amp is, it is a philosophy oriented towards simplicity, I recommend using it with the least artifice possible. 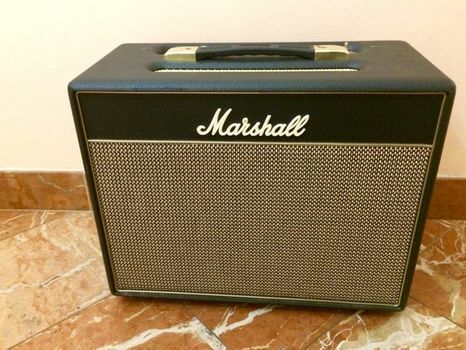 I think this amp may suit a experienced guitarist who loves his Marshall "roots". Should be all that is blues / rock. 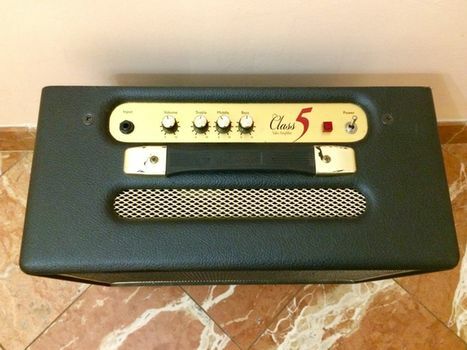 Having stopped a long time and have to work a lot for me to upgrade also makes me think that this amp would be ideal for someone who has one or two experiences. The ease with which we can work volume and the fact that the lamps promote the development of touch make this amp a good entry in ranges rather nice. From a pedagogical point of view, it seems to be a much better choice than a transistor modeling. When the price, its got the worth it. Corsaire01's review (This content has been automatically translated from French)" like a charm"
Input, 3 band EQ + volume. Since the third revision, alias the 2011 model, Marshall added a power limiter switch and fixed some recurring problems of unpleasant vibrations carried over previous models. Configuration could not be more simple, you plug it work. The manual is there but really not necessary with so little adjustments. The sound you charm, it is well on the Marshall! One might be afraid of the sound reproduction with an HP 10 inch custom Celestion but has done its office, there are serious and are generous. 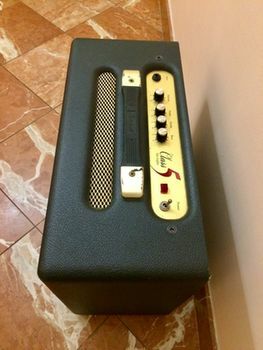 One might regret the absence of two gain knobs-volume, but as we get closer to the spirit of the early '60s Marshall models (one begins to Hendrix? ), The first third is clean, the second third it crunche and finally saturates it, simple. The limiter can go crunché / saturated without blowing the windows to land or your neighbors. if you like the effects it will turn to a pedal or pedals, no trick here. In the envelope of 5W tube, I hesitated quite a Black Star, after there was also a Mesa Boogie (ouch my purse!) But the Marshall with his style and uncompromising ultra stripped attracted me most, the adding the limiter on the combo since 2011 (not available on the model head) has finished me sell it. 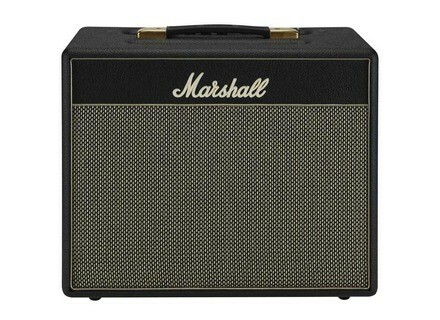 As always it's trying to see if the sound is what we seek, we are on the Marshall sound then "typed Marshall" is there.